The Sitex Colormax 5 ships with a Smart GPS sensor. The unit does contain a base map but to get detailed cartography, tide information, and buoy data you’ll need to add a map card. We filled the unit’s single card slot with a C-Map Max chart card covering South Florida for our testing. It can also use C-Map NT+ cards. We mounted the Colormax 5 display unit with the supplied plastic tilt and swivel bracket. Connections are made on the back panel of the unit with twist-lock connectors. The Colormax 5E display can be flush-mounted with supplied hardware. The Sitex Colormax 5 screen was nice and bright during our day view testing. It measures 5-inches on the diagonal with a 320 x 240 pixel resolution and features a portrait layout. As our tester slipped out to the side and viewed the screen at steep angles a small amount of screen darkening was noted. The darkening increased slightly when using polarized sunglasses. Data can appear somewhat cluttered on the Sitex depending on the range settings. No screen fogging appeared at any time during our testing. We rated the Colormax 5 good for daylight viewability after checking both the normal and sunlight color palettes. The unit has two other selectable color palettes including Night. A momentary press of the Power button activates soft key plus and minus functions to change brightness to one of six levels and contrast to one of 11. We rated the Colormax 5 good for nighttime viewability. However, we did note the screen will white out at steep viewing angles. Multiple functions for the Enter key combined with four soft keys with page specific functionality garnered the Colormax 5E a good rating for chartplotter user interface. We found this unit generally easy to navigate and use. The Sitex Colormax 5 makes effective use of multi-layered menus for control and operation of most functions. The Sitex Colormax 5 display unit measures 5.9 wide inches by 6.1 high and 2.9 deep. It can interface with the Sitex ES502 black box sounder too. Pressing the Enter key while on the chart page of the Colormax 5E brings up a Create Object menu. Here youll select one of four options, Go To, Mark, Waypoint, or Range/Bearing. Choosing Go To creates a waypoint at the cursor, draws a course line, and displays navigation information in databoxes. 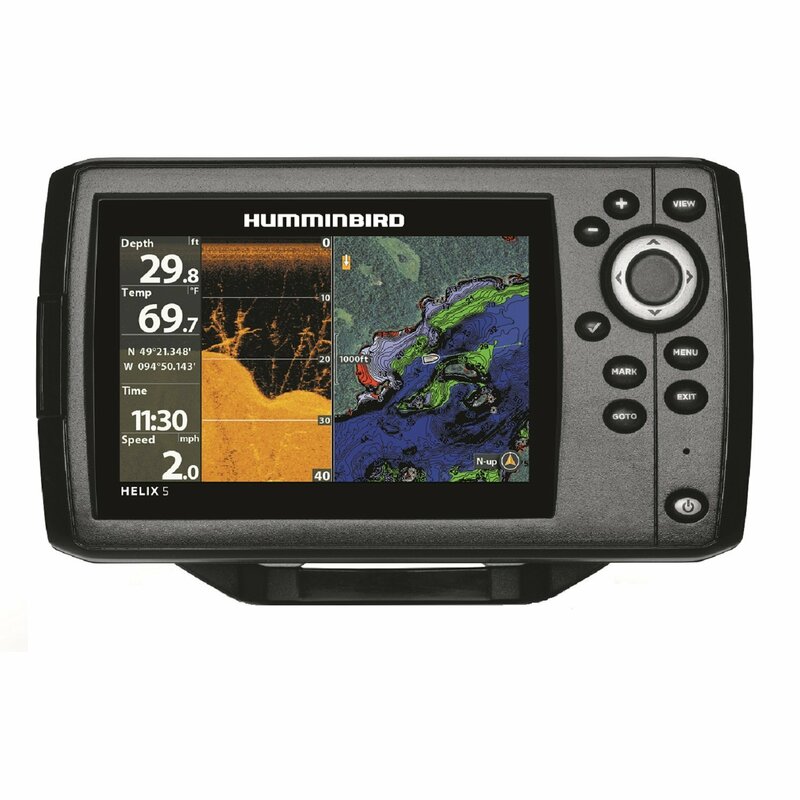 Compare Best Prices on GPS Chartplotters. To terminate navigation you place the cursor on the destination waypoint and use the Stop soft key. Picking the Mark function creates the waypoint, brings up a databox onscreen with waypoint information, and labels soft keys with useful waypoint tools. Routes are built using the cursor pad and the Waypoint choice displayed in the Create Object menu. Simply place the cursor and hit Enter, select Waypoint, then hit Enter again. After youve done this once each successive waypoint can be made by positioning the cursor and hitting the Enter key twice. Pressing the Colormax 5 MOB pushbutton once executes the man overboard function. The unit then flashes a visual warning onscreen that MOB is active. If you have data boxes displayed on the chart page they will give bearing and distance to the MOB point. Executing MOB from another page will get you the visual MOB alarm only; youll need to hit the Clear button to return to the chart page for navigation data. Although the Sitex MOB executes in a single button push it lacks in navigation functionality. Hitting the MOB button again lets you confirm or deny a MOB function exit using soft keys. The tide display on the Sitex Colormax 5 shows data in both text and graphic formats. When we try to check chart redraw speeds on the Colormax 5 by rapidly changing the map range several steps it wont allow this. Instead each time the range is shifted one step the chart must redraw before you can shift further. Still we found redraw rates to be fairly fast with this unit. North Up chart orientation on the Sitex works fine, however when the unit was set to Track Up we found it slow to respond and follow the course of our test boat. After a 180-degree turn the Colormax 5E would take as long as 30 seconds to figure out the direction of travel and adjust the chart display to match. The Sitex Colormax 5 can store up to 500 waypoints and 25 routes. Waypoints are identified with names up to nine characters in length and assigned one of 16 symbols in one of eight colors. The display unit is waterproof and carries an IPX6 rating. That means it is not rated for submersion but can withstand sprayed water. It carries a two-year parts and one-year labor warranty. Placing the cursor over a tide station icon and then pressing the Expand soft key will get you full page tide information. The same technique applies when placing the cursor over any port service icon. Placing the cursor, then selecting Info from the main menu gets you to the information list on any point too.